You are currently browsing the Bookmobile News weblog archives for April, 2013. The Free Bookmobile is now registered with First Book, and you can help us make terrific, high-value book purchases! For the past 20 years, First Book has done a great job of getting new books into the hands of children in need. By making a tax-deductible donation to the Free Bookmobile (see the “Help Us!” page on our website at http://freebookmobile.org/) with a note to “Purchase Books”, you can fund us to buy quality new titles at an incredible discount to plug gaps in our supply. Then we’ll give them away to children in need here in Sonoma County! Even $10 or $20 can buy many books. Right now, for example, Rick Riordan’s Kane Chronicles bestsellers are available for just over $1 each! These are great to entice resistant middle-schoolers to discover the fun of adventure stories. Science & nature, early readers and bilingual books are also available. Can you spare a few dollars to help us boost our shelves? 75,000 books given away! 25,000 children, adults and seniors served! Talk about spreading the love…we just hit another big milestone to celebrate with you. Thank you for helping us reach out and put books into homes. Thank you for making adventures in literacy a reality for so many who are challenged for access! We humans can do such wonderful things when we work together in a positive spirit and the Free Bookmobile is yet more proof of this simple truth. It started as simple guerrilla community service, as we barged into parks and parking lots to spread the good word (see photo – yes, that is a pop-up book featuring the Golden Gate Bridge) Now, thanks to all who have joined in, we are doing really important work and helping improve lives. Cheers! Thank you, Petaluma Community Foundation! We are thrilled to announce a new grant win, first-time support for the Free Bookmobile by PCF. 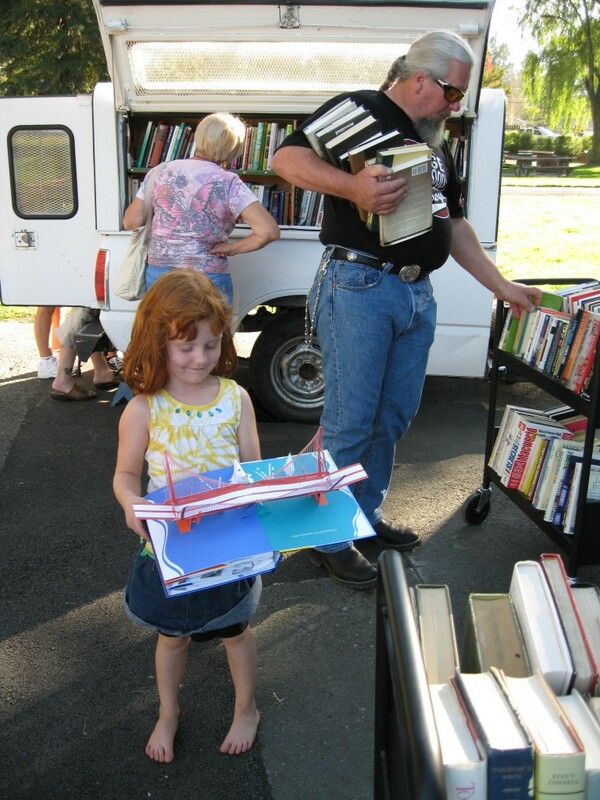 They were impressed with our previous outreach to many of their current partners and stepped forward to ensure a continued strong bookmobile presence throughout Petaluma this coming year. We love working in the area and look forward to PCF’s partnership to make our service even better. PCF will be honoring its grantees at a special gala dinner and dancing event on April 20th, which is also a fundraiser to make sure they can continue their important work. Please consider supporting PCF so they can support the rest of us. Tickets are on sale now at www.petalumacf.org.